Our online collection featured at the American Centuries website consists of over 2,000 items from Memorial Hall Museum and Library. This collection is comprised of artifacts, documents, maps, photographs and books from New England. The Collection spans a vast sweep of history: from the area’s earliest Native American inhabitants to modern times. The website includes engaging activities; resources for teachers, researchers, and students; plus a special Just 4 Kids page. 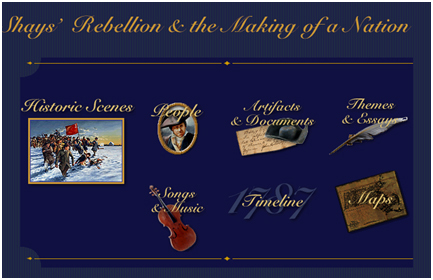 In addition, special exhibits focus with more detail on specific historical events or topics: Turns of the Centuries, Raid on Deerfield: The Many Stories of 1704, Shays’ Rebellion and the Making of a Nation, and Map to African American Historic Sites. 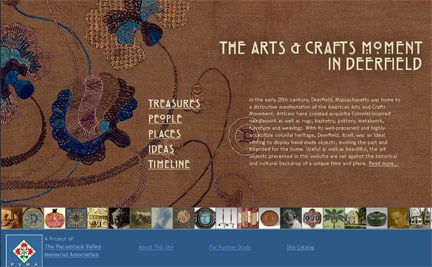 The newest of these special online exhibits looks at the extraordinary story of The Arts & Crafts Moment in Deerfield and parallels the publication of Poetry to the Earth: The Arts & Crafts Movement in Deerfield, by Suzanne L. Flynt, available here.